Athens is rightly known as Georgia’s “Classic City.” It is a beautiful small town about one hour east of Atlanta that is home to the University of Georgia. Athens shines with old southern culture and ante-bellum mansions, but also helped spawn the alternative music culture of the 1980’s. The rock groups R.E.M. and B-52’s sprang from Athens, and fans of alternative music still conduct pilgrimages from far and wide to the world famous 40 Watt Club on Washington Street where many great groups got their start. When visiting Athens, be sure to walk around UGA’s north campus filled with buildings dripping with history and beautiful, lush gardens. See the unique downtown city hall building with its domed roof covered by large, pointed “scales” and its double barrel cannon used during the Civil War. The first and only time the cannon was shot, the twin cannon balls, connected by a chain, spun around and killed the operator, and the cannon was immediately retired. Athens is also home to the Classic City Brew Fest - one of the Southeast's favorite beer events. I’ve operated the enjoyable Classic City Brew Fest since 1996. Call (706) 254-BREW or click here if you need more information on the festival. Athens has a small downtown, and beer fans will find it extremely easy to navigate themselves to all the best spots for beer by foot. Beer bars usually open around 4 pm and are closed Sundays with the brewpub opening around lunchtime and open on Sundays. For such a small place, Athens has very good taste in beer -- a wide variety of world class beers can be found downtown. Start at the prominent “arch” on East Broad Street that marks the main entrance to the University’s north campus. From the arch, walk into downtown by crossing East Broad, turn left, walk one block, turn right on Lumpkin Street, walk two blocks and take a left on Washington Street. Look for Copper Creek brewpub on your right which is where our classic pub crawl of Athens begins! 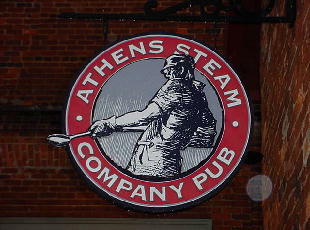 When leaving Athens Steam Co. Pub, walk back up Thomas Street the way you came and turn right onto Washington Street. Go less than three blocks to the site of Copper Creek Brewing Company on the left. Copper Creek is Athens' only brewpub and regularly rotates four house beers. 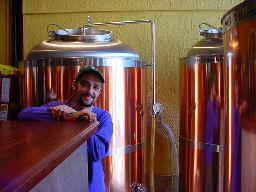 Brewer Matt Buley (pictured to the right) does an outstanding job in hand-crafting some flavorful ales and lagers. Copper Creek opened in March, 2002 with a Kolsch, Nut Brown Ale, American Pale Ale, and Oatmeal Stout that were all outstanding. Brewpubs that are this cozy, warm, and enjoyable are extremely rare. A special cask conditioned ale is offered on the first Wednesday of each month at 6:00 PM. The owners of this brewpub also run two of the best restaurants in Athens, so the food at Copper Creek is also wonderful. Some food items include: crab cake, mushroom burger, steaks, pasta, stout and molasses marinated pork chop with roasted red potatoes, cheesecake, and much more! Food is served Monday to Saturday from 4 PM to 1 AM with bar service from 4 PM to close at 2 AM. Closed on Sunday. Beer is only $2.25 per pint M-F until 7 PM. After you have checked out Copper Creek, walk left down Washington Street, turn left on the first street (North Lumpkin), and walk one block to the Globe on the right. It’s an attractive and popular place with large windows that line the front and right side of the building. There are large tables, rocking chairs, and sofas that allow great, relaxed views of life in downtown Athens from the windows. Evenings on the weekends can be quite crowded and loud, so come early if you wish to avoid this. The shiny bar is shaped like a semi-circle and is wrapped in a large sheet of copper. 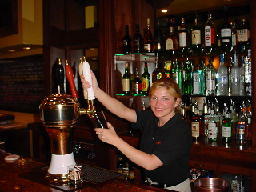 Behind the bar is an attractive sketched mural depicting ways beer and other libations are produced and consumed. This is a great social bar with recorded jazz, classical guitar, and even Indian music in the background. There is live music offered upstairs on special occasions. The Globe opens at lunchtime seven days a week. There are some delicious and unique food items available on their full menu and appetizing breads and cheeses. There are 12 draft beers along with over 100 respectable bottled beers. 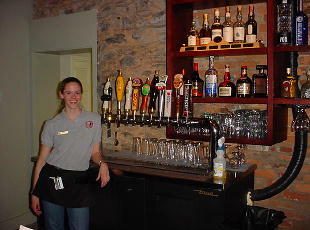 A full bar is also featured with single malts and wines. Walk left out of the door of the Globe and take an immediate left on Washington Street. Walk down the hill about two blocks to the next pub. Located on the ground floor of the Game Day Condos in downtown Athens, Game Day Pub offers a cozy, English pub-style atmosphere. There are six fine draft beers available and around 70 bottled selections, with an emphasis on the best American microbrewed and craft beers. There is no food at the pub, but patrons can sip their beer and be entertained with a rousing game of darts. The bartender will also be happy to provide patrons with hand-held controls to use with various interactive video games on the pub's widescreen TV. Game Day Pub is closed on Sunday, opens at 3:30 PM on other days, and opens much earlier during UGA home football games. Walk right when leaving Game Day and take a left on Hull Street. Swing left at Washington and look for Trappeze immediately on the left. Trappeze offers a phenomenal selection of the best beers available in the Georgia market. 200 delicious beers grace the bottle menu, and the 29 draft taps have already poured remarkable brews such as St. Bernardus Abt 12, Dogfish Head 90 Minute, La Chouffe, Gulden Draak, Old Rasputin, Victory Prima Pils, Urthel Samaranth, Spaten Maibock, Allagash White, La Merle, Maredsous, Trois Pistoles, N'ice Chouffe, Oskar Blues Ten Fidy (with cherries), Terrapin Wake-N-Bake, Maudite, Ommegang, Hennepin, Maudite, Aventinus Eisbock and Laguinitas Hop Stoopid and Imperial Red Ale. When asked why great beer is important, operations manager Mike Vernelson replied, "Beer matters to me for its complexity, variety, and taste. It matters because when people drink good beer together, it's an event. It's an experience that breaks down barriers and draws people closer together." Trappeze taps cask-conditioned beers on a regular basis, and the owners are also hoping to have regular beer and food pairings, tastings and educational beer seminars. Plan on spending a lot ot time at this Athens beer destination that currently opens at noon on Sunday and every other day at 11 AM. 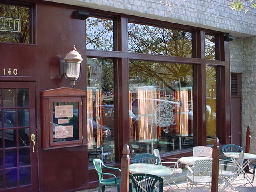 This bar and restaurant, part of the Foundry Park Inn complex, opened in late 2001. There are around 16 lighter bottled beers here and 11 drafts to choose from (including the likes of Terrapin, Sweetwater 420, Boddington's, Guinness, and Sierra Nevada Pale Ale). The pub is attached to the facility's new Melting Point music hall, and this entire complex will be host to the 2008 Classic City Brew Fest. Try the delicious pub grub. Steam Company opens at 3 PM every day. Aromas started out life years ago as a wine and coffee bar, but has now evolved into one of Athens' very best craft beer destinations. The ten draft lines serve up the most exciting and interesting beers available. Also check out the impressive array of appetizers and cheeses. Walk straight across the street to pop into Five Points Bottle Shop and Five Points Growlers to peruse the staggering lineup of craft beers for sale. This small-ish UK-themed pub is a favorite neighborhood haunt in Five Points. Owner Michael White (right) prides himself on running a friendly pub with a nice range of ales and lagers. Also take note of the extensive lineup of bottles and cans from the UK that are housed in the cooler. Sip a fine ale, watch "footie" on the telly, and munch on a scrumptious plate of house fish and chips. Chances are, you'll also make friends with a local sitting next to you. "This page serves as a guide to some great places to get great beers! It's easier than carrying around brochures, and hopefully more informative too!"